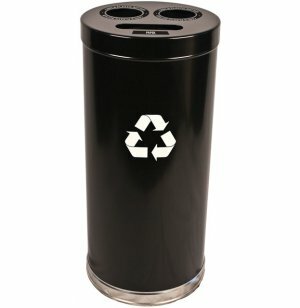 Recycling Container with 3 Openings 24 gal. Get your school or business going green with extra-durable recycle containers from Witt Industries. They are a great way to get any recycling program off the ground successfully. This highly practical recycling container features three separate openings, allowing you to save on valuable floor space by concentrating several materials in one convenient location. The three rigid plastic liners keep each commodity separate, and extend the container's life by keeping its interior clean. Servicing is simple with the easy lift-off top, and durable, recyclable labels let you decide which materials you want recycled and where. 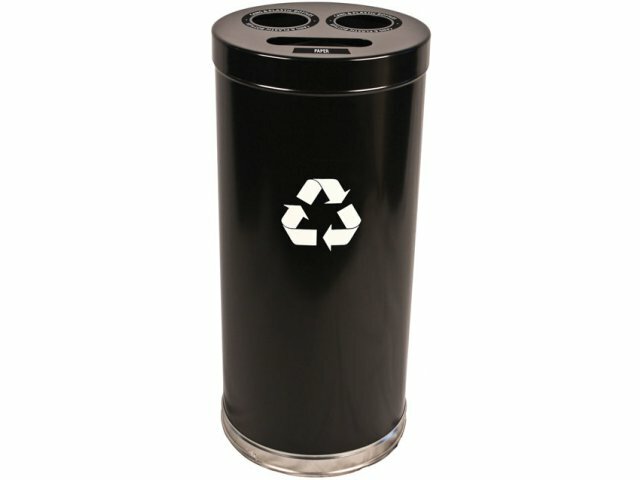 Available in a choice of colors to best match your current color scheme, these high-quality recycling containers are an attractive way for your school or business to promote "green" awareness - and make our planet a healthier place to live. Automatic Sorting: Three separate openings and rigid plastic liners eliminate the need for sorting recyclables. Space-Saving: These recycling containers save on floor space by accommodating three different recyclable materials in one convenient location. Convenient Labeling: Durable, recyclable labels are included for fast labeling of containers for cans, bottles and cans, waste, recyclables and compost. Highly Durable: Heavy-gauge metal construction stands up to the wear and tear of constant, daily use. Easy Servicing: Convenient lift-off top facilitates easy servicing.